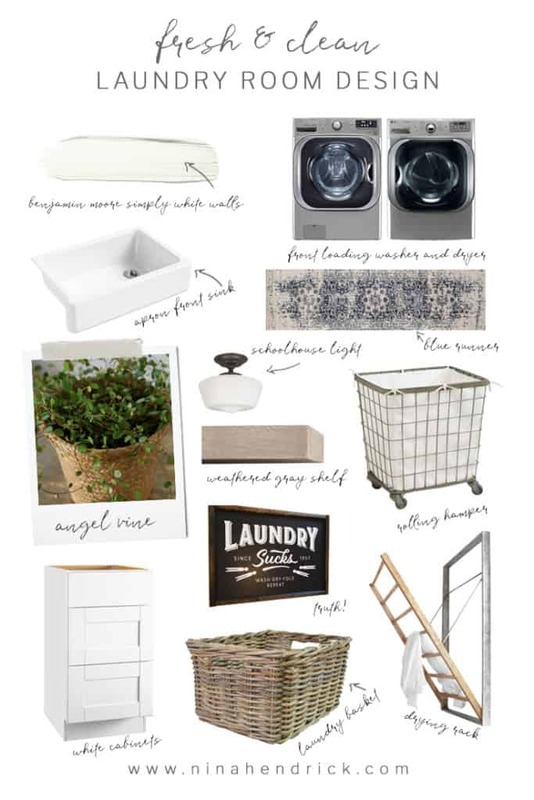 Laundry Room Project Inspiration and Mood Board | Gather inspiration to create a modern rustic style laundry room from this collection. It has been so long since I’ve shared a renovation project with you! I honestly can’t even believe how much time got away from me. 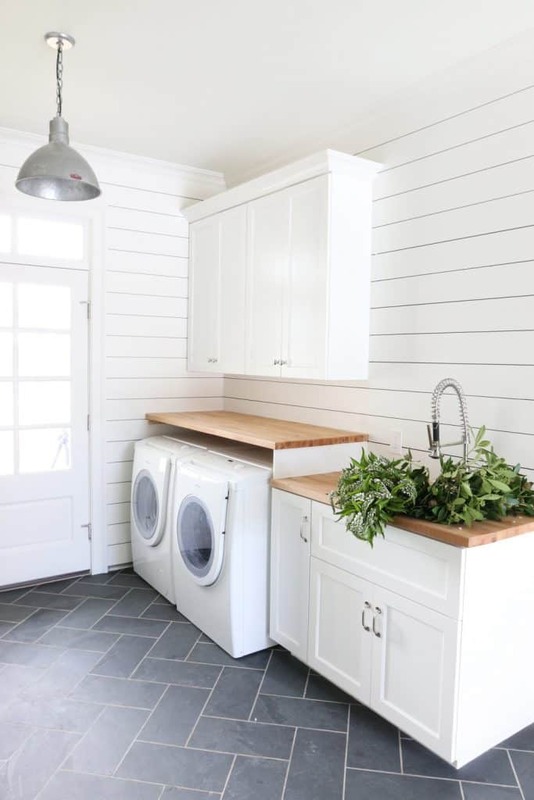 As well as playing catch up on old projects, I’m excited to chronicle a new/old project here on the blog: The Laundry Room! What happened to all of those other “old projects” I posted about and never completed, you ask (master bedroom and office, being the glaring ones)? Well, both have kind of stalled, to be completely honest. With the office, it’s more of a case of being overwhelmed by stuff (styling props). I have a clear vision of what I want the space to be, I just need to finish up a couple of small projects and get there. With the master bedroom, I’m stuck. I’m writing a post soon on how to proceed when you just aren’t feeling a certain space. I know it’s something a lot of people struggle with, too! 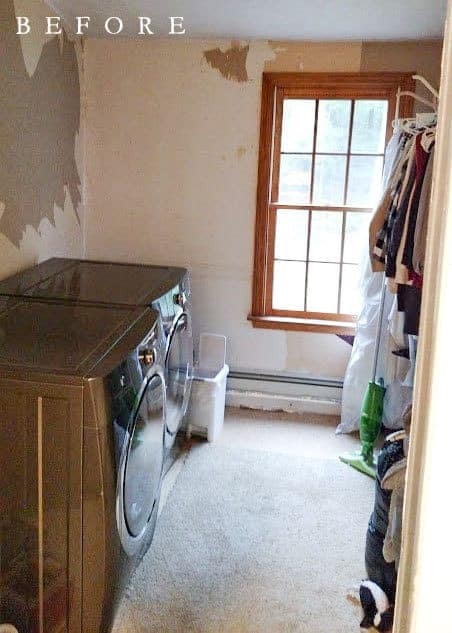 While those two rooms are at least at a point of basic functionality, our laundry room has virtually had a plywood floor with a piece of scrap carpet and has been a peeling wallpaper construction zone since we moved it upstairs in 2014. Yeah, it was pretty bleak… but still better than it being in the basement or first floor. It isn’t bleak anymore, though! I will share a progress shot below, but first, the design plan. I have a very clearly defined idea of what I’d like to do in the room. 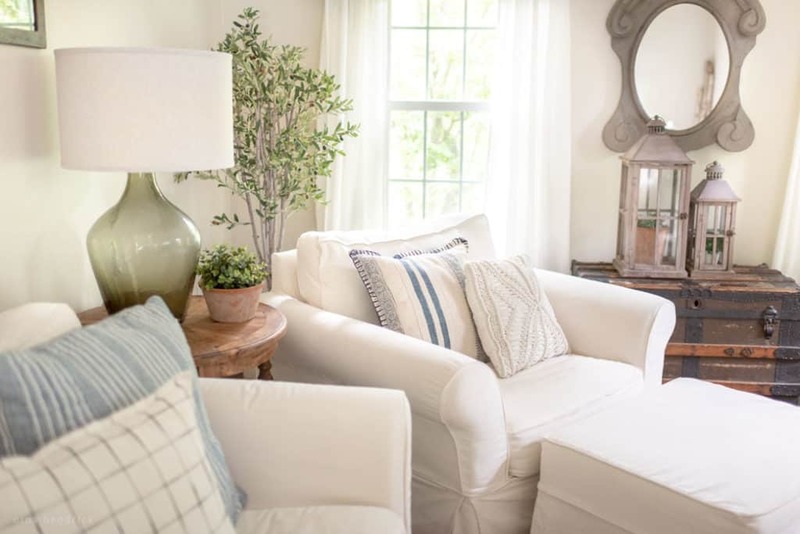 While I loved the entire design from the inspiration photo above from Studio McGee (and was enamored with the idea of herringbone floor tiles), we already purchased enough dark hickory engineered hardwood for the room when we completed the master bedroom renovation. I love the dark hickory, so it’s really fine- and I wanted to do a different tile in the master bathroom anyway. So, all in all, even though I’m not branching out design-wise, the continuity is a good thing. Two types of flooring per level of the house are really my maximum (after starting out with 6-7 different types per level- yikes). One thing I always knew I wanted was a basin-style farmhouse sink. 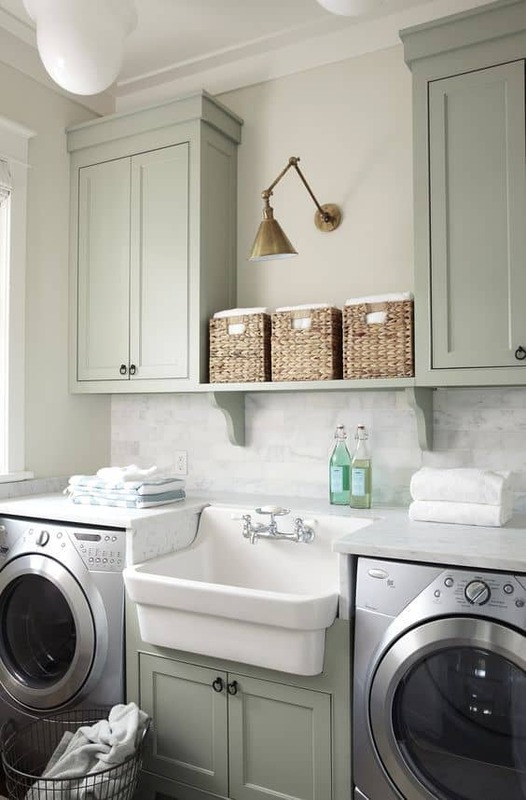 Our laundry room will have the same layout and sink as this inspiration photo. Unfortunately, a stone countertop is outside of our budget, so we will be doing butcher block like my office (and Studio McGee, above). I suggested concrete faux-soapstone, but Mack has to execute those tricky cuts around the sink, and he definitely feels like it would be much more doable with wood and a jigsaw. Also, there is a whole second side of the room! If you are a longtime reader, you may remember that we had a strange floorplan with a hallway that looped around our master closet to get to the bonus room above the garage. When we converted the bonus space to our master bedroom, we knocked down the hallway and closet and restructured the entire design. This is how it is structured now. 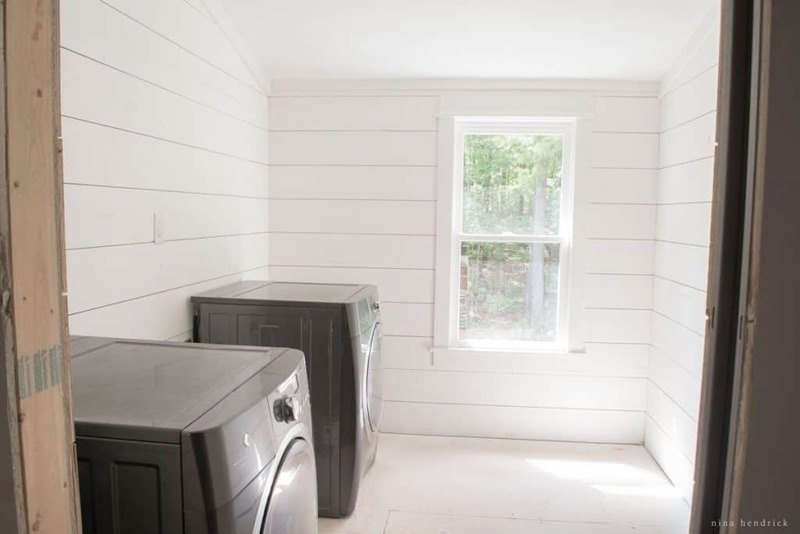 Now the laundry room shares space with “my” side of the closet (It looks huge where it’s labeled “Walk-In Closet”, but the ceiling is actually sloped, so Mack has much less of a closet). 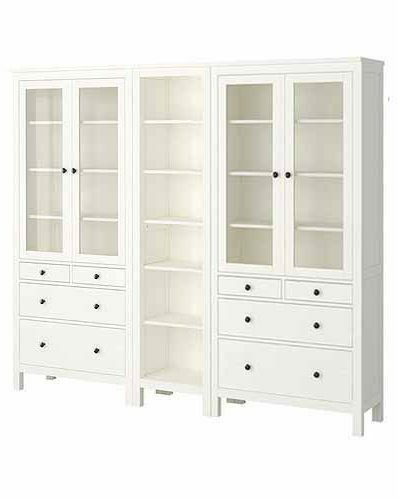 Since I spend entirely too much of my life in this room, I definitely want my closet to seem built-in and intentional. This post contains affiliate links for your convenience. Please see my disclosures here for more information. So this is where the project stands at the moment. Mack completed the planked walls by following the same process as outlined in our planked wall tutorial, albeit with slightly wider 8″ planks. I love the effect of the wider planks! He just went right over the nasty wallpaper, which saved a ton of time (We learned from our bedroom project that the stuff is miserable and won’t steam off like normal wallpaper). 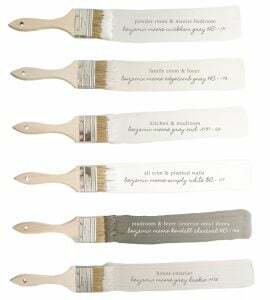 He used our Wagner PaintReady Sprayer to paint the walls Benjamin Moore Simply White. Our next steps are installing the engineered wood flooring, then building the custom cabinetry. Here is our mood board for the room. 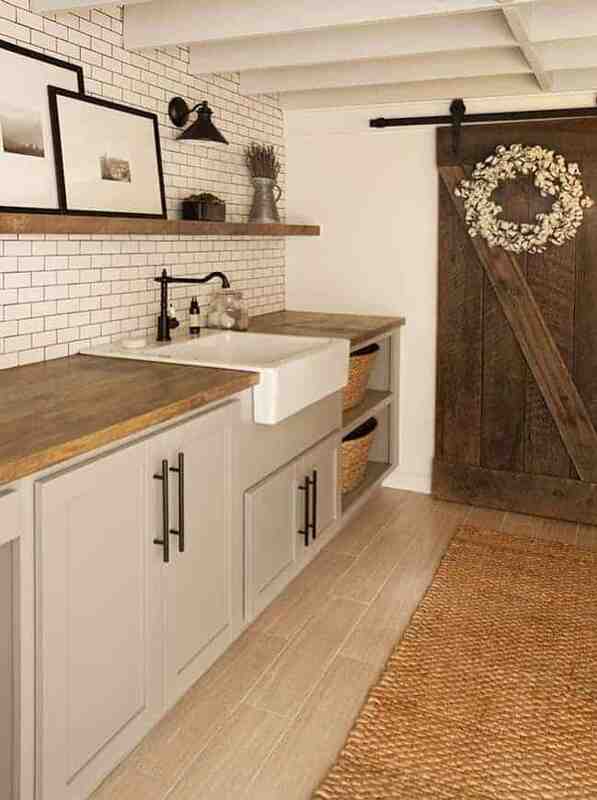 Think dark hardware to contrast all of the white, a lot of weathered wood, wicker, and all of those farmhouse touches I adore. Maybe this will actually make me want to do laundry? Maybe? (Probably not.) At least I will have a pretty room, though! Love all of it! And you all did a great job on the plank wall!